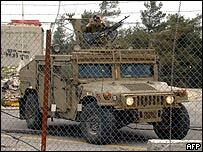 Two Israeli soldiers and a Hezbollah fighter have died in an exchange of fire across the Lebanese border. Hezbollah snipers shot at a military post and Israel launched an air strike and fired tank shells. Each side accused the other of firing first. Later on Tuesday, Israeli warplanes flew at low altitude over the Lebanese capital Beirut. The jets broke the sound barrier and drew anti-aircraft fire from ground defences. Tuesday's clashes come a day after a car bomb in Beirut killed Hezbollah member Ghalib Awali, a senior member of the radical Shia group's military wing. Israel has made no comment about Monday's bombing.Hezbollah leader Hassan Nasrallah vowed to "cut off the hands" of the killers of Mr Awali at his funeral in the Lebanese capital. The attack was carried out "either by Israeli hands that infiltrated into Lebanon with European, American or other foreign passports, or at the hands of local Lebanese agents", Mr Nasrallah said. A statement from shadowy Sunni Muslim extremist group, Jund al-Sham - reportedly formed a few weeks ago in a Palestinian refugee camp in Sidon - had initially claimed responsibility. However, a leader of the group later said the statement was a fabrication, adding that the Israeli intelligence agency Mossad was most probably to blame. Hezbollah fighters played a central role in ending Israel's occupation of south Lebanon in 2000. The group's leadership has been targeted by Israel's security services and there are occasional clashes with the Israeli army along the Lebanese-Israeli border. The last Hezbollah member to be killed in a car bomb was in August 2003. He was Ali Hussein Saleh, a security guard at Iran's embassy in Beirut. The group is considered a terrorist organisation by the US and Israel. But it is widely respected in the Arab and Islamic worlds for its role in driving Israel out of southern Lebanon and for its political organisation.